Finish It Up Friday ~ 16 patch! I finished my 16 patch quilt last week, but saved the finish for today. This quilt turned out exactly as I had envisioned. How often does that happen? LOL! The first two pictures were taken before washing. I used my Baptist fan pattern boards to machine quilt this. 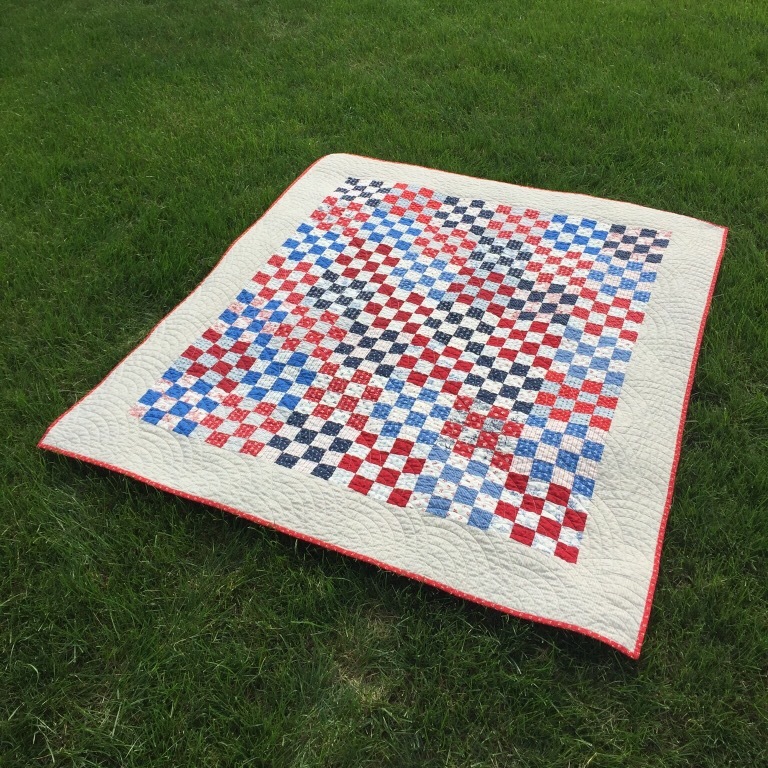 It felt like the perfect quilting design for this old fashioned pattern. And I love, love, love the texture it gave after washing! That backing fabric was a clearance fabric that has been in my stash for a while. It was perfect with the fabrics in this top. This will be a Quilt of Valor. I don’t yet know the recipient, though it may go to one of Daughter #3’s friends. I love this quilt so much, that I kind of want to keep it for myself! But I won’t. Have a wonderful day! 26 Responses to Finish It Up Friday ~ 16 patch! That will definitely be loved by whomever receives it. They will surely feel all the love that went into it’s creation too. What a great quilt to snuggle under! 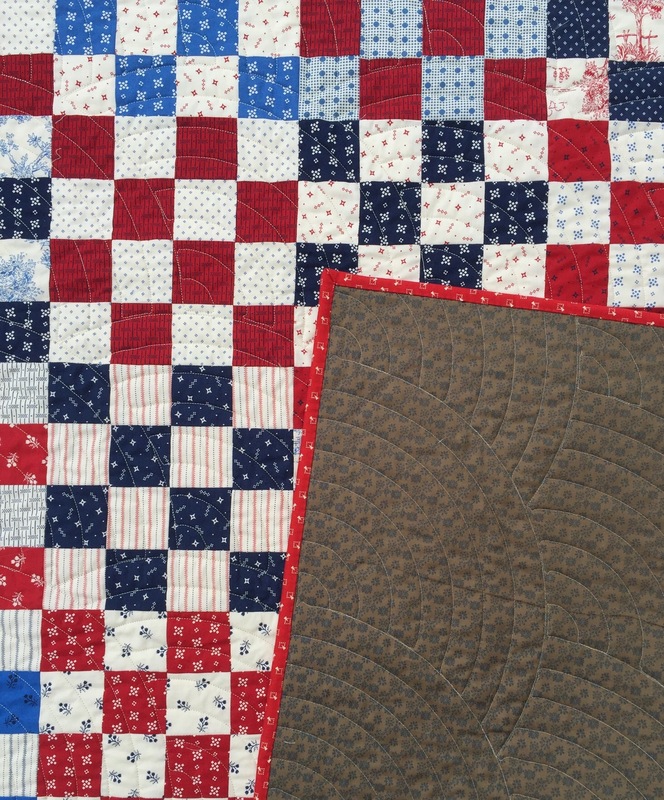 I am wondering what a “Baptist fan pattern board” is, because I love the quilting. I guess it’s the board part I don’t understand. I absolutely love your quilt! I’ve been searching for a jelly roll friendly quilt to make for my husband. This one is perfect. It’s patriotic (he’s a vet), it’s beautiful and classic. Absolutely an instant antique heirloom! The backing is wonderful and so is your groovy board Baptist Fans quilting on it. I vote to keep it in the family, at least. What a great looking quilt. Love the look even more after washing! TFS. Great job. I love quilts of this style. Great job and great gift. Love that it turned out just as you envisioned. I think it would be a great QoV for your daughter’s friend. What a beautiful quilt – all parts fit together so well. Are those pattern boards the ones you use with a stylus attached to the machine? It did a great job! 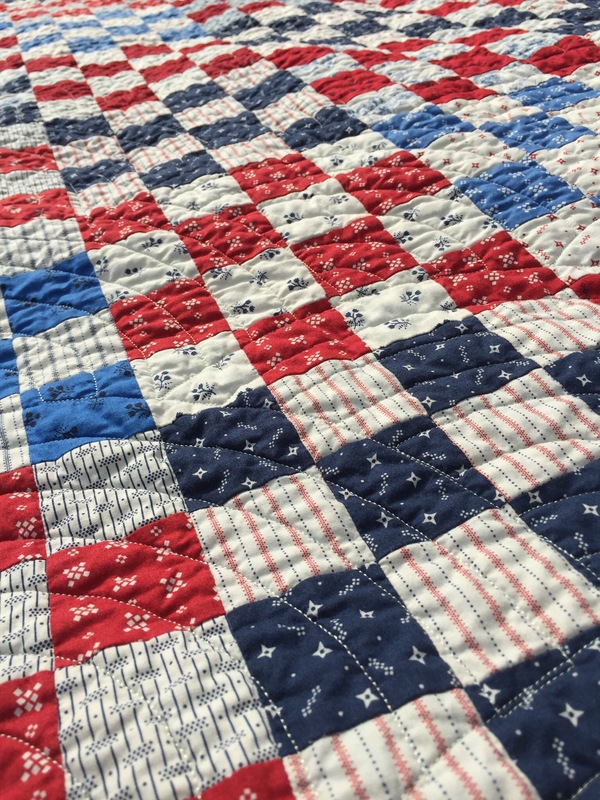 There is something about a quilt made of squares–simple, but wonderful. Wow, it turned out great! 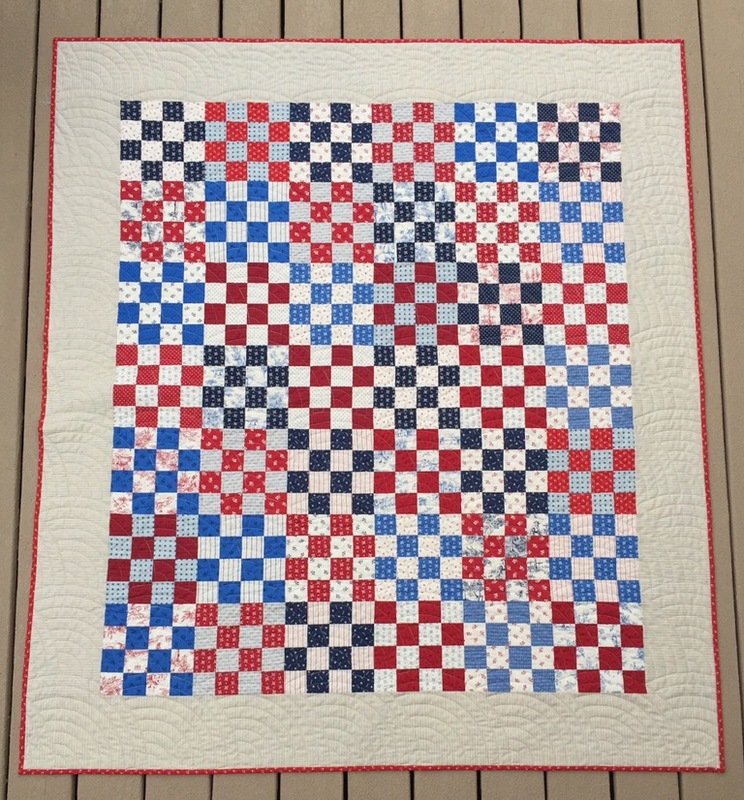 I love everything about it…the 16 patches, the patriotic colors, the fan quilting and how it will honor the recipient. Great job!! Beautiful finish, Katy! I know you get tired of hearing me say that I love how the really simple quilt blocks yield such amazing quilts…but I cannot help it…this one is a real beauty. 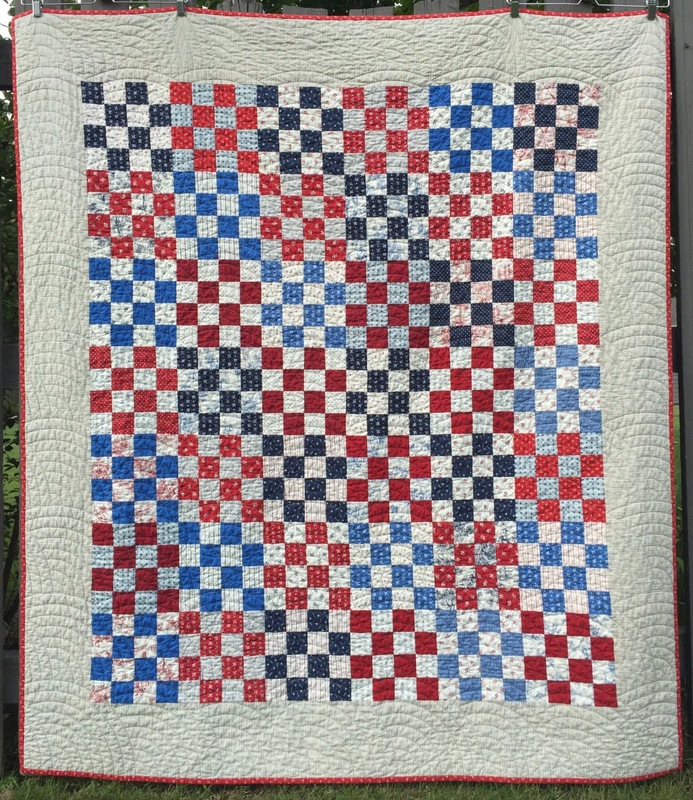 Baptist Fan is one of my favorite quilting designs and it was the perfect choice for this quilt….as always, thanks so much for sharing!! Great simple finish! They are sometimes the best. I can see why you don’t want to let this one go! This one looks so vintagey and comfortable and just plain beautiful. I like everything about it. Especially the pattern, colors and quilting! 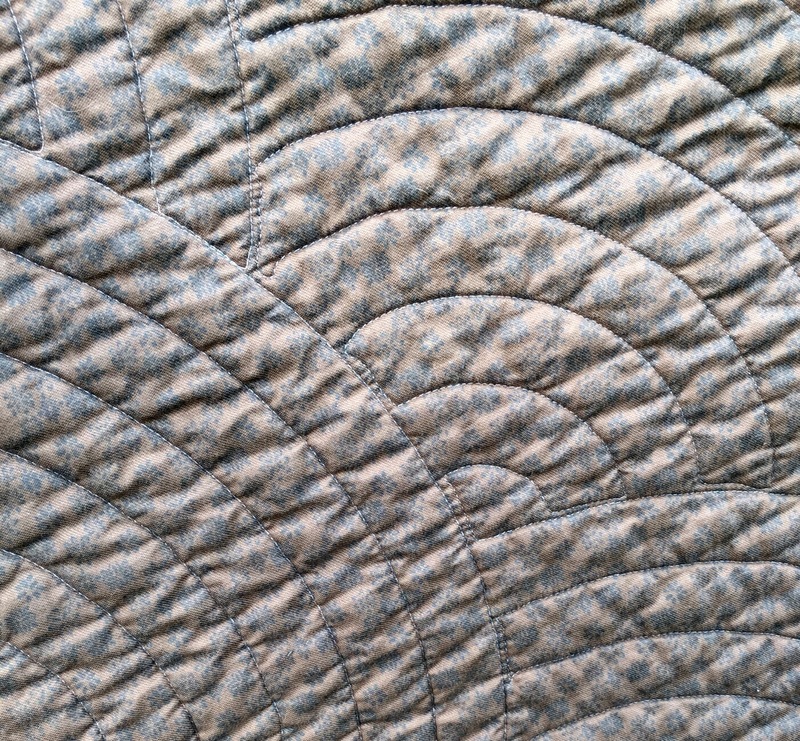 I always want to try quilting a baptist fan after seeing one of yours. This is beautiful. It’s a beautiful quilt – I like baptist fans on just about everything. I have made three 16 patch quilts this year, one I have gifted to my dear sister in law and kept two! There is just something so cozy about this quilt and perhaps it is just the traditional quilt square. I love it. I am also a big fan of the Baptist Fan. I do wonder what size it finished. Such a great quilt! Wow! That turned out great! I’m sure the recipient will love it. I can see why you would want to keep this quilt for yourself. It is beautiful! 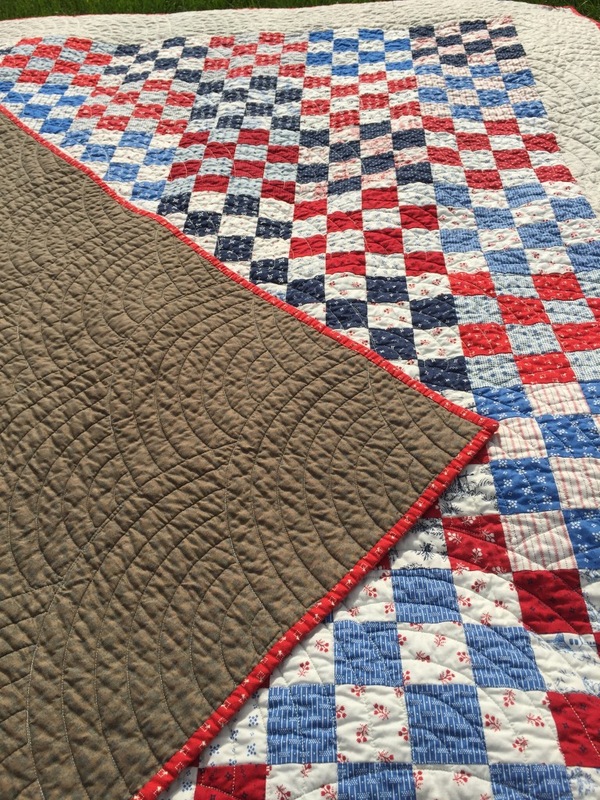 Making 16 patches is so relaxing and they look so nice in the red, white and blue fabrics. Your quilting is spot on, too. Squeal! I LOVE this one! 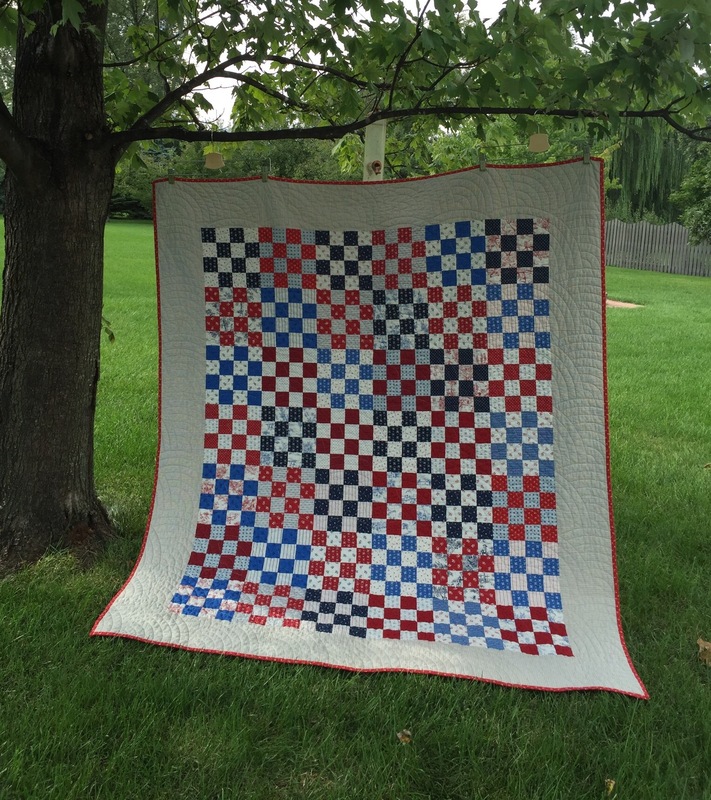 Can I borrow the idea for my next Veteran’s quilt please? This is sensational. What a pretty quilt, and I love the Baptist fans! It looks amazing. I just love this simple pattern. Your quilting is perfect too.